Danat Al Ain Resort, the award-winning 5-star hotel resort in the Garden City of Al Ain, joined the entire nation and the more than 7,000 communities in 187 countries and territories around the world who observed Earth Hour, a landmark movement that addresses global warming and climate change. 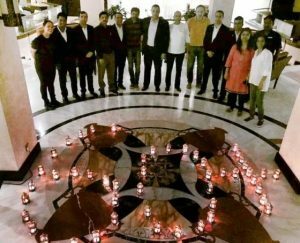 A brief ceremony was organised at the hotel garden where team members and guests gathered to witness the switching off of lights signaling the start of the Earth Hour movement. At exactly 8:30pm on March 24, Danat Al Ain Resort switched off unnecessary lights and appliances throughout the hotel for 60 minutes while several hotel guests also dimmed or turned off the lights inside their room. Other guests dined in candle light as a show of support. Millions of people around the world switched off their lights for Earth Hour on March 24, a movement initiated by the World Wildlife Fund (WWF) in 2007. The world’s largest grassroots movement advocates for eco-consciousness. This year’s theme was “Connect 2 Earth”, which highlighted the importance of biodiversity that is declining around the world. The three-year campaign will emphasize the connection between climate change, biodiversity and people and will encourage everyone to take action to stop the loss of biodiversity.